Lambs and Turtles and Bees, Oh My! A prison can conjure images of concertina wire, heavy cell doors, and prominent watchtowers. Not bees, sheep, and other forms of wildlife. But these critters and more have become a common sight in Washington’s correctional facilities. Bringing wildlife into correctional facilities is possible through the Sustainability in Prisons Project (SPP). It’s a collaboration between the Department of Corrections and Evergreen State College. SPP leads science and environmental sustainability programs within a correctional setting. Several of these endeavors bring inmates into direct contact with wildlife. The outcomes of the program benefit both the animals and incarcerated participants. Inmates collect data about the wildlife they oversee. The data often provides insight as to what a species may need for conservation. Meanwhile, inmates receive hundreds of hours of hands-on education that can improve rehabilitation. A 2013 report found incarcerated individuals in correctional education programming are 43 percent less likely to reoffend. SPP Co-Director Kelli Bush reports several formerly incarcerated participants have enrolled in college because of their SPP experience. Further research has shown programs where inmate interaction with animals improves facility safety by creating calmer environments. Inmates at Larch Corrections Center in Clark County and Cedar Creek Corrections Center in Thurston County help rehabilitate sick turtles. State officials listed the western pond turtle as endangered in 1993. The turtle is native to Washington, but can range as far south as Baja, Calif. Years of habitat loss and predation from non-native bass and bullfrogs brought the turtle to the brink of extinction. At one point, only about 150 turtles remained in the wild. Further exacerbating the turtles’ demise is a type of shell disease. Researchers haven’t yet determined what causes the disease. It eats away the turtles’ shells. Without treatment, it can kill them. SPP has trained a team of incarcerated individuals at each participating correctional facility to serve as turtle technicians. 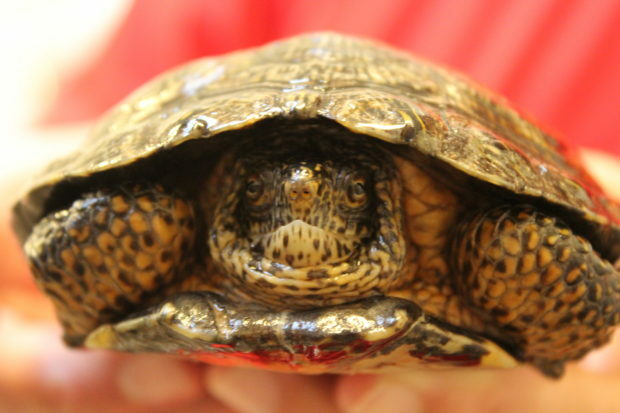 They care for turtles after they have received acute veterinary care. Partner organizations including the Woodland Park and Oregon zoos, PAWS Wildlife and Rehabilitation Center and the Department of Fish and Wildlife support the program and provide leadership for the species recovery efforts. Each facility has a room with special tanks for the turtles. The technicians feed the turtles, clean their wounds and track their health. They record observations about the turtles’ progress in reports. SPP shares the reports with zoo biologists and veterinarians. 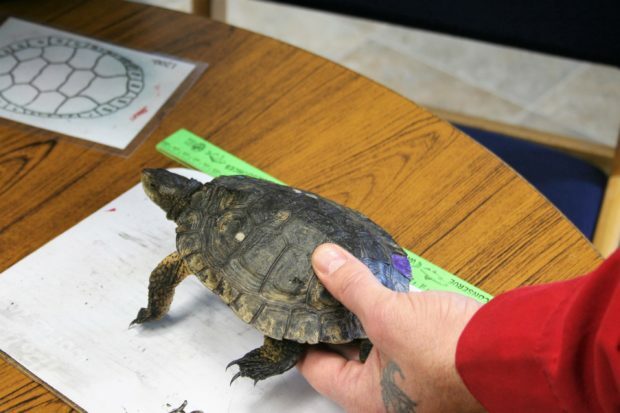 Those experts make recommendations on how the inmates can proceed with turtle care. 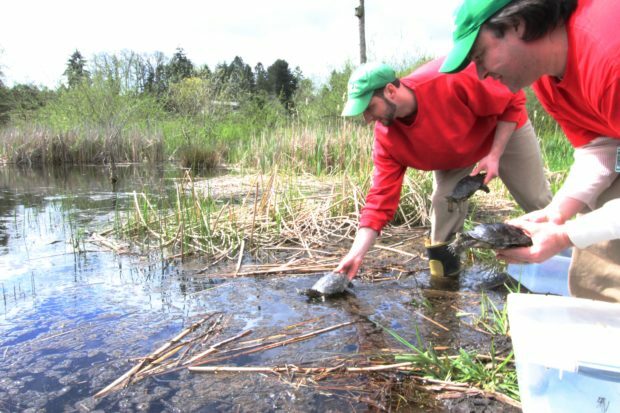 Since 2013, SPP has successfully rehabilitated and released 92 western pond turtles. One of SPP’s newest efforts involves bighorn sheep. In 2018, inmates at Washington State Penitentiary began raising sheep inside a fenced pasture across from the main institution. Domestic sheep and goats can carry a pneumonia-like bacteria called mycoplasma ovipneumoniae, or M. ovi, for short. 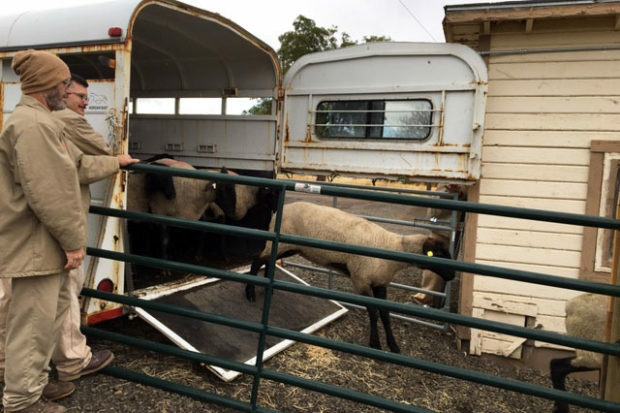 It’s not a big deal for most livestock on farms, but if a wild bighorn comes into contact with infected domestic sheep, they can catch the bug. It’s often fatal and can wipe out entire flocks of wild bighorn sheep. Inmates at the penitentiary spent last year learning about sheep husbandry, the care and breeding of animals. They took workshops on bighorn sheep ecology and wildlife management. They also oversaw the day-to-day feeding and caring for sheep. They even assisted with the birthing of several pairs of lambs. The goal of the pilot program is to determine if partners can create a flock certified free of the M. ovi bacteria for later sale to small herd owners. So far, no private sheep owners have been able to raise sheep free of the disease. The program began with 15 ewes and one ram. 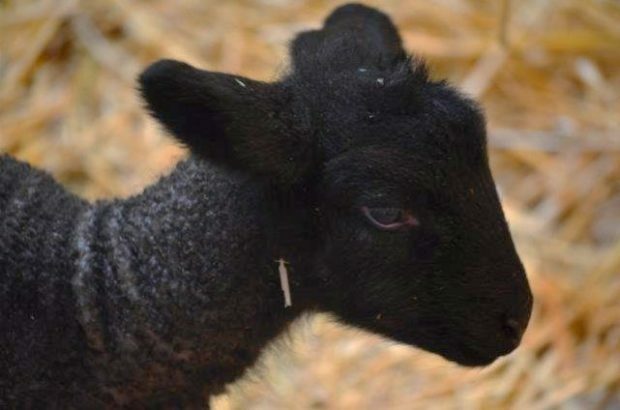 Since spring of 2018, the flock has produced 28 lambs. 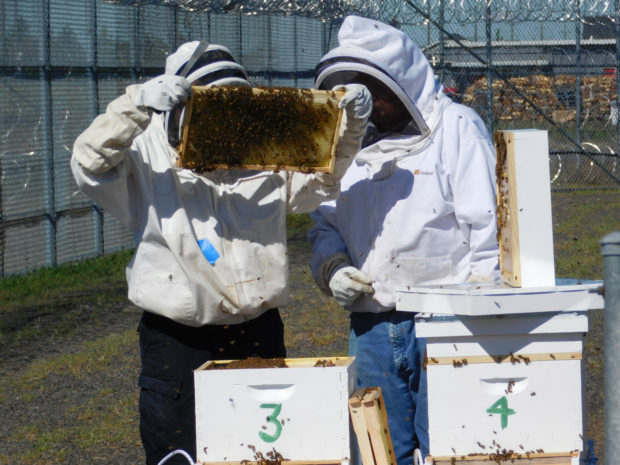 SPP has beekeeping programs at 11 Washington state correctional facilities. Inmates look after hives with help from local chapters of the State Beekeepers Association. In total, there are 60 hives in the facilities across the state. The hives contribute to honeybee conservation and restoration. Incarcerated individuals start by learning how to keep honeybees as a hobby. From there, they can learn how to manage bee colonies and gain commercial beekeeping skills. The incarcerated participants can also earn various beekeeping certifications through the Washington State Beekeeper’s Association. In 2018, 323 incarcerated individuals earned apprentice status and 12 became journeyman beekeepers. Journeyman beekeeper is the second level of the master beekeeper program. SPP has butterfly rearing programs at two of the state's correctional facilities. One program recently helped uncover migration patterns of west coast monarch butterflies. Inmates at the penitentiary are working with Washington State University researchers on a joint project. The project aims to map monarchs’ migration paths. Incarcerated technicians observe the monarchs’ lifecycle, from egg to adult. Once the adults emerge, inmates tag the insects and release them. Between 2012 and 2016, incarcerated technicians raised 13,778 monarch butterflies. The tags contain contact information for scientists. Over the years, citizens who’ve spotted the tagged monarchs reported their sightings to researchers. Some of the penitentiary’s butterflies ended up on California’s southern coast. Experts say monarch population dropped up to 90 percent in recent decades, due to pesticides, habitat loss and climate change. Now that scientists know monarch flight patterns, they can work on identifying what plants the butterfly needs to lay its eggs during the journey. All inmates —about 15– are in a social skills group. Inmates in the program often report improved mental health and wellbeing, program officials say. Women at Mission Creek Corrections Center for Women in Belfair are helping save butterflies as well. 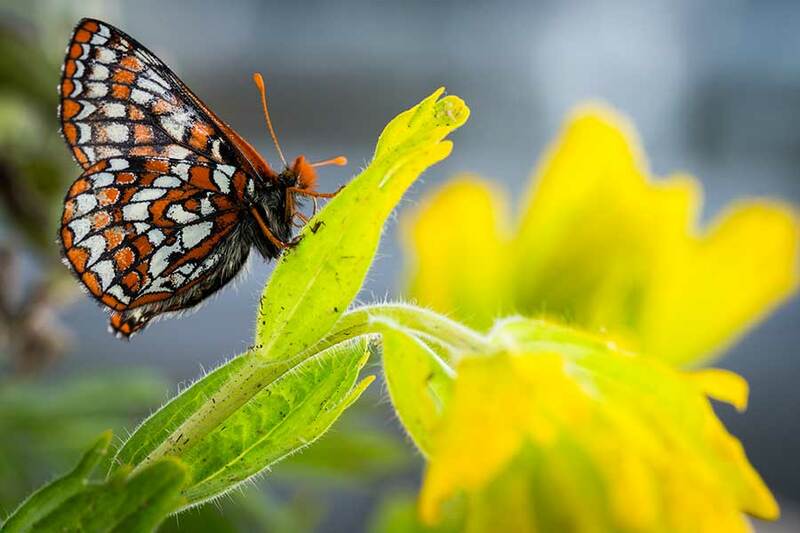 Incarcerated women at the facility raise Taylor’s Checkerspot butterflies. The butterflies are identified as federally endangered. They once flourished from southern British Columbia to central Oregon. Increased urban and agricultural development, along with forest encroachment and fire suppression, have wiped out most of the Checkerspot’s prairie habitat. They’re now found in only a couple of pockets in the Pacific Northwest. Women at the correctional facility began raising the butterflies in 2011. Biologists have released more than 18,000 caterpillars and adult butterflies that the women reared in local prairies. Their efforts seem to be paying off. Researchers report the butterfly population at one release site doubled between 2015 and 2016. At another site on Joint-Base Lewis-McChord, biologists deemed the population now self-sustaining. SPP officials hope the experience incarcerated individuals gain improving chances of success for wildlife species while they’re behind bars will help them improve their own chances of succeeding once they release from incarceration.